Create a circular Garden wherever you have a space of 3 meter diameter! It can provide you with your basic fruit and vegetable needs! Adjust it! Expand it! Share it with friends! 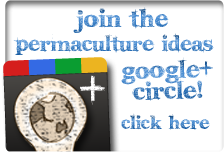 Permaculture rocks! And growing your own food does rock even more! Path to Freedom presents 'A Homegrown Revolution' A collaboration of selective media clips which feature their urban homestead and farm which focus on the need of radical action -- growing food in the city. This self produced, short music video was shown at Peter Seller's Cultural Art's class at UCLA followed by a short presentation by urban farmer, Jules Dervaes founder of Path to Freedom. The class focus was on the art of slow food and among other guests invited were Michael Pollan, Alice Waters and Eric Schlosser. Since the early 80's the Dervaes family has slowly transformed their ordinary city lot into a self sufficient urban homestead. Please visit the video's page on YouTube for credits, by clicking HERE. Did you know that in the UK your council has a legal duty to provide you with an allotment? You just need a group of 6 council tax paying residents. This kind of information is provided by Landshare, a UK-based resource that brings together people who have a passion for home-grown food. Landshare came out of TV’s River Cottage. It began when Hugh Fearnley-Whittingstall helped some Bristol families grow veg on derelict council land. The experience was so inspiring that River Cottage decided to see if it would work nationwide. Now Landshare is a national movement of more than 50,000 people. They even have an iPhone App! Click Here for more information regarding getting a plot together with 5 other council tax paying residents. The folks at Occidental Arts and Ecology Center and the Water Institute have published a useful booklet, Heating Water With the Sun: A Thermal Drainback Solar Hot Water Heater Demonstration. "This solar hot water heating system is designed to heat water with the sun using a non-pressurized open loop of plumbing that is not tied into the plumbing of the bath house. In this indirect system, roughly 200 gallons of water gets pumped from a special solar thermal storage tank (see next photo) to the panels and back to the tank several times a day getting hotter with each cycle. These panels do not store water to be used directly by users in the bath house as they do in a passive batch system. Instead, they are designed to heat the finite amount of water that gets repeatedly pumped through a storage tank and uses a heat exchanger to heat the actual water to be used in the building. These panels are designed to run the water through as much piping as possible to maximize the amount of time the water is exposed to the heat of the sun. They are placed on a south-facing roof at an angle that ensures the fullest exposure to the sun." The booklet includes an extensive list of resources and can be downloaded as a free PDF. Great stuff! Some more reflections on permaculture and how it's changing lives and providing insights on creating tangible connections with our surroundings. Pretty inspiring! I had a zero budget this year for my garden so I used recycled building rubble for the stones and an old unused compost bin, I just layed newspaper on the grass, applied some garden compost, added Bio char and some old tin cans, another layer of newspaper and then a layer of garden compost, the only material I bought was a few growbags to top up the soil and seeds. "Send a Cow works alongside some of the poorest people in the world to help them create brighter futures. This year, we will help almost 16,000 families on their journey out of poverty. And because our farmers are encouraged to share the help and support they receive, they'll go on to lend a hand to an average of 10 further families, creating a ripple of hope across communities in rural Africa. It's a special benefit to our work which really sets us apart. Thanks for reading this. We look forward to hearing from you! The Send a Cow team"
Rainbow Valley Farm was established in 1988 by Joe Polaischer and Trish Allen on what their neighbours referred to as 'rubbish land'. Wall-to-wall gorse weed, and deemed unfarmable. The most inspiring thing for me was observing such a richness of life, and such diversity in an evidently established state, and then discovering that it was all done in less than 15 years! Here's an amazing story reminding us that if we devote our energies to developing beneficial, tangible realities we're establishing real physical connections - a living system of co-creating elements, which provides that entire system and all it's co-ceators a better position. In 1988 we arrived at the run-down farmland we had purchased in Matakana, north of Auckland, New Zealand, in a housetruck, carrying with us a dream to become self-sufficient and tread lightly on the Earth. We had been influenced by our travels in the Third World and the stark evidence we found of the unfair distribution of wealth. We had also discovered permaculture and read the books by Bill Mollison and David Holmgren. Permaculture made sense to us and we were keen to put it into action. We named the farm “Rainbow Valley Farm” because we saw so many rainbows arching over our new home. The land, considered to be “rubbish land” by local farmers, was eroded, weed and pest infested, and the heavy clay sub-soils were a bog in winter and as hard as concrete in summer. The waterways were choked with an introduced aquatic grass. The first few years were hard going, and at times we wondered if we were crazy! But now, 22 years later, we have a highly productive organic garden and orchard, an energy-efficient passive solar home and a wonderfully rich lifestyle. Animals, birds and bees are integrated into our edible landscape. We produce most of our own food on the farm and sell our surplus at our local farmers market in Matakana. We have planted approx. 13,000 trees over the years - timber, firewood, amenity trees and over 800 fruit and nut trees. Our compost toilets (the ultimate in recycling) help close the loop by providing rich compost for our fruit trees — what comes off the land goes back to the land. We are aiming for zero waste. Our water comes from springs near the highest point on the farm, and is gravity fed to our house and gardens. Our used water with all its nutrients goes to the orchard. The farm has become known as a model of permaculture and now we run tours and workshops each summer to share what we have learnt with others. Over the years we have hosted groups from garden clubs, schools, kindergartens and university students from New Zealand and overseas, as well as government ministers and United Nations advisors. We also take in a small number of interns and volunteers who work with us on the farm and take part in our daily lives.